Be safe, be Preggy Protector safe! Effective in helping to maintain the seat belt over the hip area rather than the abdomen, without affecting the safety use of the seat belt. Sudden braking and low-speed impacts can propel an adult forward. This can cause a standard seat belt, positioned above or below a woman’s abdomen, to exert extreme pressure on the uterus and unborn child. This could potentially cause injury to the unborn child or even a miscarriage. Stops the seat-belt from riding up onto the pregnant mother’s stomach, helps prevent injury to you and your unborn child. Suitable for pregnancy and recovery after Caesarean. Prevents pressure from seatbelt after Caesarean. International Patent. “Should a woman wear a safety belt while she is pregnant?” The answer is simple: Yes, in conjunction with a specialist product like the Preggy Protector™. The Preggy Protector™ works together with all motor vehicle seat belts by preventing the lap belt from riding up onto a woman’s pregnant stomach. This will ensure the safety of the unborn child should sudden braking or a low speed collision occur. 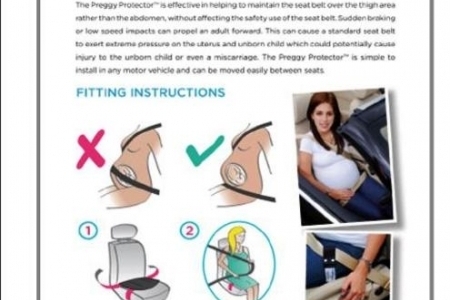 The Preggy Protector™ is simple to install in any motor vehicle and is easily moved between driver and passenger seats. Why wear the Preggy Protector™? using the Preggy Protector™. The Preggy Protector™ is also suitable for women who are in caesarean recovery. Foetal breathing and nervous system disorders. Foetal arm and leg injuries. 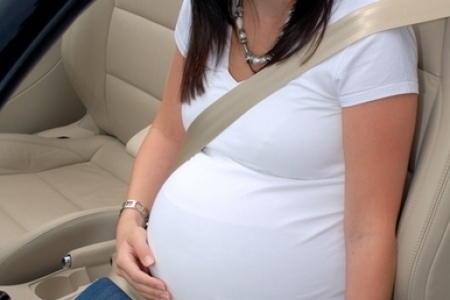 Studies have shown that wearing a safety belt is the safest way to travel for mother and unborn child.Many factors can contribute to the above risks during automobile collisions. These risks can be reduced by wearing The Preggy Protector™ with the safety belt as it helps position the lap belt correctly and comfortably under the pregnant stomach.